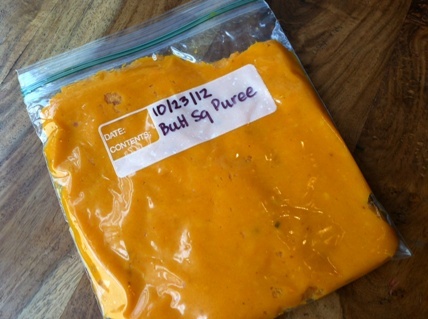 This is my recipe for a Butternut Squash Soup Base–a puree, really– that can be used in a variety of dishes. If you have been looking for more ways to save money at the grocery store, recipes with hearty vegetables like butternut squash are a great way to do it. Enjoy a meatless night once a week and explore some vegetable options that you may have never even tried. Butternut squash is a great source of fiber, as well as vitamins C, A, and E, plus magnesium, and potassium. When I’m preparing this puree, I simply take my butternut squash and cut it in half, take all the seeds out of the center, and put it on a baking sheet and roast flesh side up. I put it in the oven with garlic, apples, and onions that have been halved or quartered, and I roast them all together for about 20-25 minutes on 400 degrees. What will happen is that everything will get all roasted and brown and it will begin to caramelize, giving you a wonderful base with a rich, sweet, and nutty flavor. Once it is roasted, just take it out of the oven and allow it to cool completely. Once cool, you can puree the ingredients with a small amount of chicken broth or milk. You don’t want to overdo the amount of liquid. You just want enough so that it doesn’t clog up your food processor or blender. You can use this puree for making your own baby food, and as the base for lots more recipes, including my Recipe for Roasted Butternut Squash Soup, Butternut Squash Ravioli, and the sauce in my Roasted Butternut Squash Lasagna (recipe coming soon!). 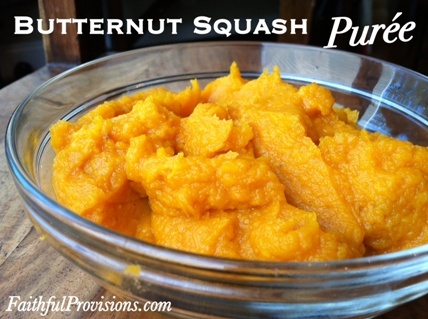 You can learn more tips and tricks for cooking butternut squash several different ways HERE. Do you put oil, salt, pepper on the sqaush? Do you put the onions and apples inside the squash or just on the pan with the squash?